Claps and Bangs: Film, Sound and Sync. Claps and Bangs: Film, sound and synch. In the 1980s, when working as an assistant film editor at the BBC, I came across a hand-written text that a colleague had attached to the wall of one of the corporation’s 120 film cutting rooms. Entitled The Beaufort Synch Scale, after the famous wind scale of the same name, this terse document defined degrees of loss of sync, from one to ten. The first level, corresponding to “smoke rises vertically” on Beaufort’s scale, was “stiff upper lip”, followed by level two: “loose lower lip” and so on. The tenth level (Beaufort’s “very widespread damage to vegetation”) was defined as “wrong film”. The Beaufort Synch Scale memorialized the perpetual and often ingenious struggle undertaken by film editors and their assistants to keep picture and sound in synchronisation, a consequence of the fact that in traditional film editing, picture and sound are recorded on separate media -celluloid film and its magnetically coated equivalent respectively- and remain thus until the final stage of the process, when a “married” print conjoins the two on a single strip of celluloid via a series of intermediate processes. Interestingly, “stiff upper lip” could be the product of the sound being slightly early, whereas most subsequent degrees of loss assume lateness of sound. This possibility points to another way in which film does not correspond to nature, where sound is always late relative to vision. (It has been a common practice of editors to synchronise the sound of explosions filmed from a distance when in reality the sound would follow some time after the image). “1. A hand tapping a matchbox on the window-sill with the tap itself coming right in the middle of the take (90 frames). 2. An incomplete view of the window (30 frames). The repeatable section of the picture (take 1+2) remains constant and lasts for 5 seconds (120 frames). The repeatable stretch of sound, in which apart from the tap there is silence, is 5,O833 second long (122 frames). With each repetition of the action the sound falls behind the picture by another 0,083 seconds. This means that if in the first audio-visual variant the tapping is synchronous, the next synchronous tap will occur in variant 61” (1). Thus the picture moves –rotates- forwards, while the sound moves in the opposite direction, shifting incrementally until it arrives back in synch after five minutes, at which point the film ends. The work’s efficacy turns on the contrast between its absolute structural transparency and the autonomic responses it stimulates and focuses, responses similar to those experienced when engrossed in a narrative movie. As the sound in Matchbox starts to lag behind the picture, it feels as if it is still being generated by the box-tapping hand, but at a distance in time. One has the sense of there being a causal delay, or rather it feels that that is what one wants to impel: one strains to keep the causal link alive, well past any point of rationality. Next, a rhythm emerges between the box hitting the surface -the bang- and the cut to the window-sill, a rhythm composed of equally spaced image events with the sound event halfway between them; box tap, sound, cut-to-window-sill. This lasts for a short while, to be gradually replaced by the sound moving into conjunction with the picture cut. Once one realises that this is going to happen, a strong urge, a sense of anticipation, or alternatively, a willing for the sound to move forward, to accelerate so as to synchronise with the picture-cut, takes hold. This is eventually satisfied, yet it is an irrational satisfaction because the bang and the cut don’t naturally belong together, obviously. Even when the bang is in its rightful place, as generated by the box hitting the table, synch is only a function of framing: for synch to occur in a film or video, it’s necessary for us to see the event that generates the sound. As soon as picture and sound recording devices are spatially separated by even a few feet, synch is effectively lost, not because of the difference in speed between sound and light, but because the camera is no longer looking at what the microphone is recording. Godard demonstrates the way synch sound becomes effectively non-diegetic, and vice versa, in the Mozart farmyard chapter of Weekend (1968). In his film Videotape with Bicycle Sound (8’, colour, sound, video, 2001) the English filmmaker Colin Crockatt records himself on video setting off on a bicycle equipped with a mini-disc recorder. As soon as he leaves the frame –the camera is left behind on its tripod to film the park in front of it- the sound goes out of sync. Or does it? Insofar as camera and sound recorder are recording at the same time and broadly the same location, picture and sound could be said to be in synch, or at least contemporaneously conjoined, but in terms of cinematic conventions synch is lost, simply because the camera isn’t pointing at the source of the sounds on the soundtrack. This situation persists until Crockatt arrives back in frame at the very end of the video (2). Tim Bruce’s little-known precursor to this film Underground Movie (, 12′, 16mm, b&w, sound, 1973) rehearses a similar strategy. A cameraman (the film-maker John Smith) films inside a London Underground train. We hear what we take to be synch sound, but which doesn’t consistently fit the visual environment. Eventually a sound recordist with a Nagra tape recorder –Tim Bruce- steps onto the train, approaches the camera and taps the end of the microphone to create a definitive synch point, before walking away. 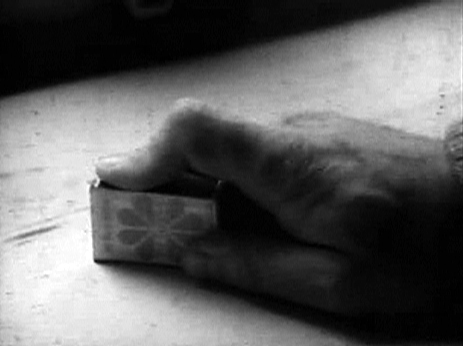 “Cutting on the beat”, which occurs twice in Match Box at the points where there is a cut to the window sill and a cut back, is considered by editors to be a dreadful filmmaking cliché, but that dread evidences a resistance to the strong desire for the mutually reinforcing integration of sound and image. Match Box, though, supersedes the cliché, or overhauls it, since the two points at which it occurs are integral moments in a continuous structure that is non-hierarchical in form but highly uneven as an experience. One wants to stabilise and regulate certain rhythmic conjunctions or disjunctions, even though any given such moments only occur strictly once. However we seem to will certain rhythms to continue for several repetitions, and this says something about how we struggle to manage the material by ordering it into phases or stages. What we should do is surrender completely to the constantly drifting sync events, in which case the experience becomes disconcertingly ineffable. The point in Match Box at which the bang synchronises with the cut to the window-sill arguably fits the definition of “wrong film”: the two events, though not entirely unrelated, do not belong together in any natural, causal sense, but that doesn’t weaken our sensation of there being a causal connection: the cut seems to cause the bang, or is it vice versa? This moment in the film illustrates Hume’s sceptical admonishments regarding our strong disposition to attribute causal connections to events that coincide with or succeed one another where there is no empirical evidence to warrant such an attribution. The sound in Match Box is as much a music track as it is documentary sound, and its rhythmic beat connects it to the Sink section of Michael Snow’s film Rameau’s Nephew. In Sink, Snow drums with his hands on an empty sink (3). After a while he drops a plug into the plug-hole and turns on the faucet, continuing to drum as the water fills the sink to the very top, at which point he is splashing in shallow water, resulting in a kind of miniature version of kicking through waves. He then pulls the plug and continues to drum as the water empties out. 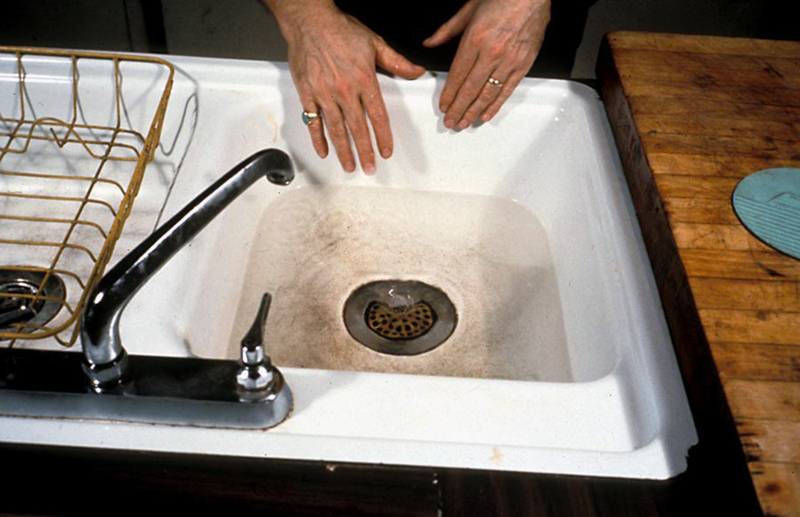 In their discussion of this section of the film, Ivora Cusack and Stéfani de Loppinot focus on word play –sink / synch- and correspondences between the world and language, and between image and language: “The faucet figures language in many regards: a liquid flows out of it, just as language and its sound cascade from the mouth” (4). One could add: “pulling the plug” in a metaphorical sense: Snow pulls the plug on the sequence at its mid-point, after which its conclusion is inevitable. The water drains away like sand through an hour glass, and time runs out for the film. Conversely, the sound’s resonance increases as the quantity of water decreases: less is more, or rather, more air equates with more sound. This symmetry though is unbalanced in a sonic sense, because the sound of the sink filling is loud and splashy, whereas the emptying is much quieter, apart from the odd gurgle. Overall, in musical terms, there is a diminuendo, a splashy middle section, then a crescendo. This is just one of many symmetries in the film. The water, as well as changing the resonance of the sink contributes another sound to the mix, and comes close to dominating at the point where the sink is full. This mix is like a slow dissolve, but built in to the situation, arising organically from it. Sound rises from the sink, amplified by its highly resonant volume. Evidently the sink is made from something like fiberglass or thickly coated steel, but not porcelain, and not stainless steel either, which sounds a lot less “dry” than fiberglass. Snow enacts a primitive musical event, using the most natural of beaters –human hands- and a mass-produced, but primitive, resonating body –the sink (5). The latter is rectangular, and its proportions correspond quite closely to the aspect ratio of the film frame: 1: 1.33, corresponding to 3 x 4 in video parlance. Furthermore our angle of view on the sink is similar to Snow’s, so that a kind of symmetrical relationship is established between his extended hands and our directed gaze, which is drawn around the perimeter of the sink by Snow’s hand movements as he drums on its four edges. Curiously, the sink’s design is such that its apparently shorter sides align with the frame’s longer, horizontal ones, and while the sink is symmetrically centred in the frame, the composition as a whole is asymmetrical, with part of the draining board visible to our left and a wooden work surface on the right. The faucet extends into the frame from the bottom left area at a 45° angle, aligning diagonally with, and indicating, a different symmetry, that of the square within the frame’s rectangle (the “1” part of the 1: 1.33 aspect ratio). The sink, which resembles a drum in some important respects, becomes one, in the act of being so used. One could also think of it as a Foley artist’s tool: if one were to put the sound to the image of rain beating on a tar-paper roof, it would be hard to identify its true source. enthusiasts are obsessed, if not distressed, by these variables. Entire houses have been rewired with oxygen-free copper or even more exotic materials, components cryogenically treated, and, specifically, listening rooms populated with sound absorbing objects in order to “tune” the space, to prevent it from contributing its own resonances to those of the recording, much as cinema auditoria are draped in sound-absorbing materials. Sink’s resistance to this neurotic culture is embodied in the sound of the water, which in a sense interferes with the drumming sound. Its presence is necessary to affect the change in timbre but at the same time it imparts its own character on the total sound of the work. This is consistent with the work’s transparency of means, an ethic shared by both the films discussed here: no process may be introduced that does not inscribe its own contribution to the overall process into the work. I discuss this film and related ones in my book Film Art Phenomena (BFI, 2003), pages 167-177. Rameau’s Nephew by Diderot (Thanx to Denis Young) by Wilma Schoen by Michael Snow, 16mm colour film, 266 minutes, 1970-74. Ivora Cusack and Stéfani de Loppinot, trans. Pip Chodorov: Rameau’s Nephew by Diderot (Thanx to Denis Young) by Wilma Schoen by Michael Snow, accompanying book to the Revoir VHS edition of the film, 2002, Paris: Exploding, pages 45-46. Steve Reich composed Clapping Music, for two pairs of hands, in 1972, right in the middle of the production period of Rameau’s Nephew.